Email info@silvertonmountain.com or call (970) 387-5706 for info about these events and more. Celebrate with Silverton Mountain as we fill the weekend with fun events, clinics and a presentation from pro-skier Wendy Fisher! Bring your favorite ski partner, young and old and of all genders as we celebrate the leaps and bounds women continue to make in the sports of skiing and snowboarding. Package includes discounted guided lift tickets! PURCHASE YOUR TICKETS TODAY! Calling all girl squads & rad women. Dive into heli skiing with all-female groups in the San Juan Mountains! This package is the best hookup for heli skiing we will offer all season. 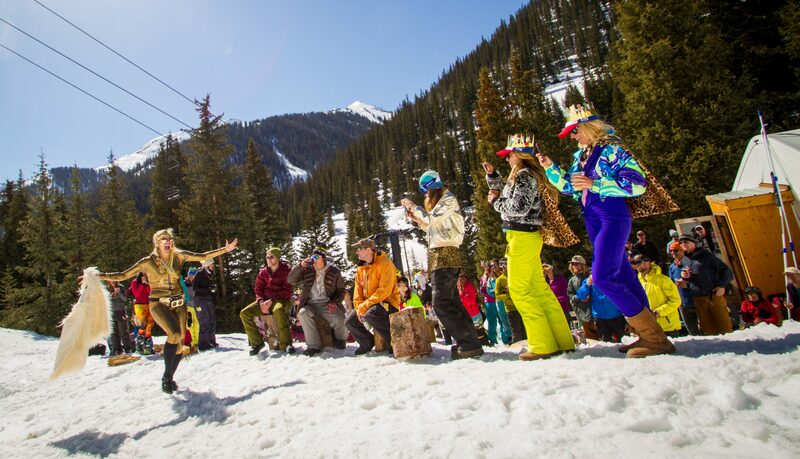 Come ski guided February 10 and 11 at Silverton Mountain and we will throw in the parties, giveaways, and a heli drop to boot! You won’t want to miss out on the inaugural Big Mountain Betty Fest! Call us for details at (970) 387-5706 or book today and reserve your spot. We’ll be spinning the POWDER Lift for unguided skiing for 2018/2019 Season Pass Holders only. This includes the Solid Gold Pass, the Unguided Season Pass, and the Kids Pass. Quantities of these passes are limited, get yours today or you’ll miss out! Silverton Sister’s Meeting in the Mountains is quickly becoming a must do for women in the outdoor and snow sports industries to rendezvous for phenomenal expert-only skiing, networking, inspiration and education. This annual meeting in the mountains is a weekend packed with skiing or riding steeps, participating in educational and inspirational presentations from some of the most well respected women in the industry. Now held on Saturday, Brewski is an afternoon of beer tasting with Colorado’s finest microbreweries. Breweries in the past have included Avalanche Brewing, Steamworks, Carver, Ska, and Elevation. This year will be a rip-roaring good time. Admission* includes a logo’d tasting cup, unlimited pours, and a round trip shuttle . Theme: Canadian Tuxedos and Daisy Dukes- rock your favorite denim atrocities. Last day of the season and always a party! Get it while you can! Traditional Avalanche and Ski Guide Training has been focused on snow science and snowpit-based methodology, but this leaves out many important practical protocol techniques. In this workshop industry leaders will share the techniques and thought processes they have developed and used in the field. With more than 60+ years of combined experience, this team has spent a lot of time innovating in the mountains, and has gained experiences and insights that are essential for ski/snowboard guides, ski patrol and aspiring professionals. Anyone that accesses mountains from the top down or spends time in avalanche terrain can benefit from this cutting edge workshop offered at Silverton Mountain. The Training Workshop is useful for anyone currently working in avalanche terrain, but is most helpful for Professional Ski Patrollers and Professional Ski/Snowboard Guides working in mid or high alpine terrain. Attendees should have an existing Level 2 Avalanche or equivalent, professional patrol or ski/board guiding experience, or be an aspiring professional with industry experience. We look forward to an exciting and educational time with you in the steeps!